Sounds beautifully on vocals and also amazing as a DI for bass, acoustic or synth. Based on the famous Langevin Preamp. Let me know if you have any questions. The Mercury AM16 is a 19 rack mountable version of the original American, modular, transistor type preamplifier built in the 1960's. The AM16 is well known for being over all very musical, open and airy on the top end and having a tube-like "air" characteristic not found in most amplifiers of the same type. The Mercury AM16 is available in both two channel and one channel (AM16/1) versions. Features include: Input Pad (-24dB) as well as a Adjustable Input (Pad) Attenuator (-0, -6, -12, -18 and -24dB), Phantom (48V), Phase Reverse (Polarity), an Output Control (Fader) and a newly designed FET Direct Input, per channel. The Mercury AM16's internally mounted power supply uses a toroidal transformer and is regulated for super low noise and stable performance. In addition each amplifier channel is locally regulated to eliminate cross talk between channels. The Mercury AM16 is housed in a beautiful, gray hammer finish, steel chassis and the aluminum front (control) panel has a custom powder coated finish giving the Mercury AM16 the look and feel of the "vintage" original. MERCURY AM16 BACK PANELThe inputs and outputs of the Mercury AM16 are coupled through custom wound transformers that are modeled after the originals. 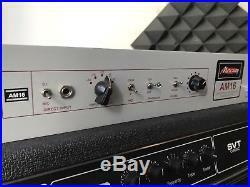 The Amplifier gain is set at 50dB like the original "R" high gain setting. We have also added features that make the Mercury AM16 more flexible than the original or even a modern rack solution. We have worked with many of the vintage AM16 modules. At Marquette Audio Labs we have been racking and modiifing modules since 1994 and the AM16 has always been a personal favorite. We have always had continuous great feedback from clients about the musical characteristics of the AM16. But the original modules have not been made for some 30+ years and supply is not able to meet demand. The Mercury AM16 solves that problem with the same fully discrete, "transistor type" circuitry and more importantly the same musical quality and performance of the original modules. 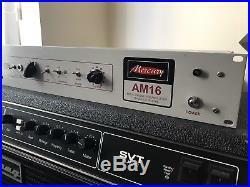 The Original AM16 Amplifier Literature stated: The AM16 is primarily a microphone pre-mixing amplifier (mic pre). However, its performance also qualifies it for use as a post-mixing (booster) and as a low-level program amplifier. Of special note is the low noise generation figure. Mercury recording Equipment has achieved it goal with the Mercury AM16. This goal was to make it possible to use the amplifier to its original, full potential. 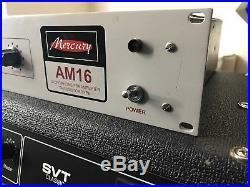 The Mercury AM16 can be used as a microphone amplifier (mic pre) and you can also use it as a line amplifier (booster) by using the combination of the -24dB pad and the Input Attenuator (Pad) and Output Fader control. This gives you the option to run your mixes through the Mercury AM16 or use for additional (musical) gain on another device, when needed. Thirdly, you have the option of the Direct Input on the Mercury AM16, which was added for uses for direct recording of Bass and Electric guitar as well as keyboards and drum machines etc... The FET Direct Input on the Mercury AM16 is very full sounding. There is more mid range and low end presence than most D. S as well as an open and airy top end that the AM16 is famous for! 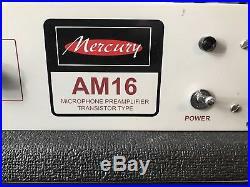 The item "Mercury Recording AM16 Mic Preamp" is in sale since Thursday, April 12, 2018. This item is in the category "Musical Instruments\Pro Audio Equipment\Preamps". The seller is "dazaudiobay" and is located in London. This item can be shipped worldwide.